This dish was requested by my wife. Years ago before we had our twin boys I had made this dish one evening in Northern Michigan staying at my in-laws cottage in Lake Leelanau. It was in my Mario Batali phase where I was watching his cooking show on FoodTV and had even had a few meals at his restaurant Babbo’s in New York City. Two key things I learned from Batali during this phase. One, don’t over-sauce your pasta. Just gently coat the pasta. Two, use fresh pasta because dry pasta just doesn’t make a great pasta dish. 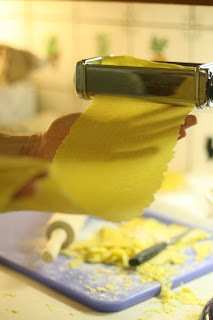 I took a course at William-Sonoma’s at the Somerset Collection a couple years ago that showed me how to make great homemade pasta using our Kitchen Aide mixer with the optional pasta attachment. Combine the first three ingredients in the mixer and mix for 30 seconds on a low speed. In a separate bowl, combine the last three ingredients using a whisk to combine. Pour the liquid mixture slowly in phases to the flour mixture with the Kitchen Aide using the flat beater to combine. Do this until the dough can be formed, but not sticky. Add a little extra water, 1 tsp at a time as needed to get right consistency. 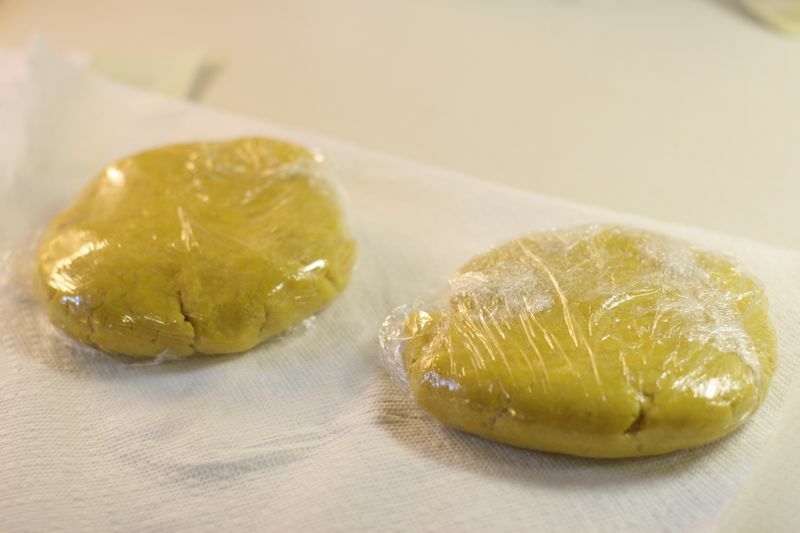 Separate into two balls then wrap in plastic and flatten into discs (see image below.) Let them rest room temperature for 30 minutes. Have the pasta pass through the extractor each time lessening the number by one until you pass it through on #7. Fold the pasta over two times and then repeat the process two complete times and now you should have a long, almost see-through piece of pasta. Cut and set aside. Repeat this process with remaining pasta dough. 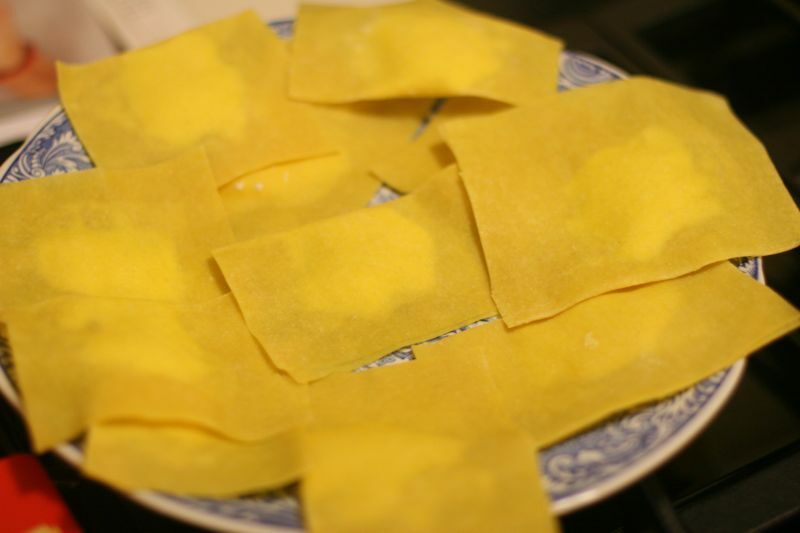 Cut each pasta sheet so that you can fold over a piece with a dollup of the ricotta mixture. To make the ricotta mixture combine 1 cup of ricotta cheese, 2 tablespoons of grated Parmesan cheese and 1 tablespoon of olive oil and blend with a fork. Place 1 teaspoon of mixture on each pasta square. Wet the edges with a little water and seal each ravioli. Bring a pot of water to boil, salt, and cook the pasta for about 5 minutes until tender. In a separate saute pan make the sage butter sauce. Add the butter and brown it on medium-high heat. Once all melted and getting a dark color add the sage and cook for 15 seconds and then add the cooked ravioli. 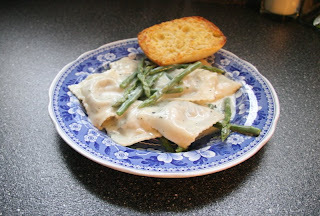 Toss in some cooked asparagus too (optional) and serve immediately with some grated Parmesan.